Hidalgo Moya was a Spanish-American who married a girl from Leicester, England. 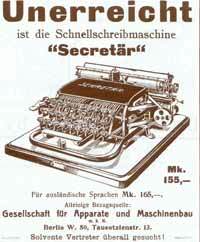 When he moved back to Europe, he brought an interesting invention with him: the Moya Typewriter. He went into business with his father-in-law and built a factory in Leicester. 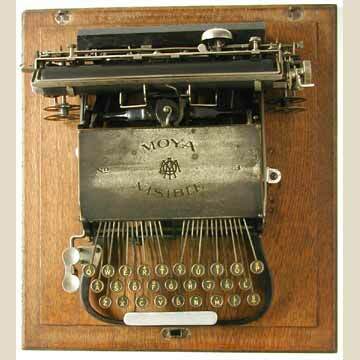 The Moya typewriter, that operated with a typesleeve similar to the Crandall, was not a very successful machine. Not too many were sold between 1902 and 1905, when the improved Moya Visible 2 appeared. The type sleeve with six rows of characters was turned and shifted by an intricate system of gears and levers. Printing was done by the sleeve that moved forward onto the platen. Some further improvements to the mechanism were made and in 1906 the Moya 3 appeared, that is presented on this page. A 1910 German ad for the Sekretar, the locally built version of the Moya 3. In 1908 production of the Moya was stopped in favor of a new invention by Hidalgo Moya, a downstrike machine that would become a major success: the Imperial. The Imperial Typewriter Company of Leicester would continue to produce typewriters until well into the 1960s.